Is it Worth Building a Gaming PC? My first custom gaming PC, was an Intel 486DXi> Games were barely running 16-bit graphics and was running on just 512kb of ram! Those were the days when data storage was not as readily available and power demands were lower but those days are no more. Today, users are like vampires, demanding more information, more color and an even more immersive gaming experience than the last. Here’s some reason’s why you should build your own gaming pc. Many people think that building a computer is an expensive process that ends up more costly and time-consuming then buying a desktop computer off the shelf. The truth is that you can often save a fair amount of money ending up with a lot more for your money and the best thing is you dont need anything more than some common sense, a screw driver and google to do it! Even if your on a budget you can pick up a solid system that has overclocking options and a mid range graphics card from places like eBay. If you have not built a pc before, it’s not as hard as you think, you cannot put anything in the wrong slot because it simply wont fit and if you do get stuck the motherboard documentation is always very well written and informative. If you forward plan, lay all your components out and organize everything, there is very little that can go wrong. 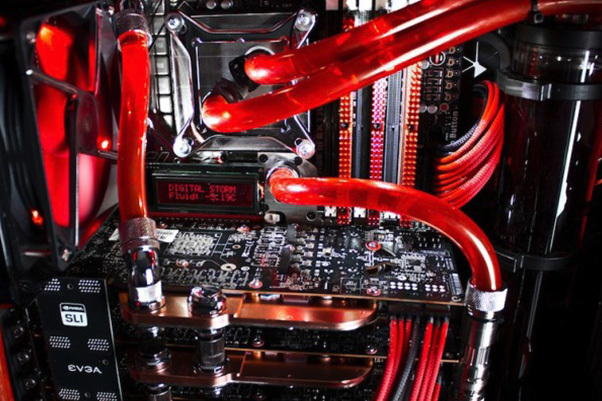 Just make sure you avoid these common pc build day disasters. When you finish building your first ever custom gaming computer, with your head buried in the back of your new gaming computer you plug everything in and turn it on for the first time and get that lovely fresh smell of hardware – the unmistakable smell of new technology. Your hearts thumping and you’re thinking to your self, “I hope it works I hope it works” – The computer beeps and your heart skips a beat and you start to panic because you never heard a PC make that sound before. ‘Blink’ the screen comes on and you let out a sigh and pat yourself on the back and realise it really wasn’t as hard as you was led to believe. Building your own computer brings a huge sense of achievement, bragging rights and boosts your confidence to do bigger bolder things next time like Liquid cooling your pc. If you have an old computer sitting in the garage or shed, go and grab it plug it in and make sure the computer still works. Open it up and take a picture of the insides making sure to get all the components and their connectors in view. Proceed to take everything apart and lay all the components on static proof bags, while handling the computer components make sure you are in contact with the pc case at all times this ensures you are ground and stops your electromagnetic charge shorting any of the parts. Once you have taken the computer apart, refer back to your picture and rebuild the computer, many screws that come out are a universal shape so don’t worry about putting the wrong screws anywhere, if they are not meant to go there they will simply not fit.